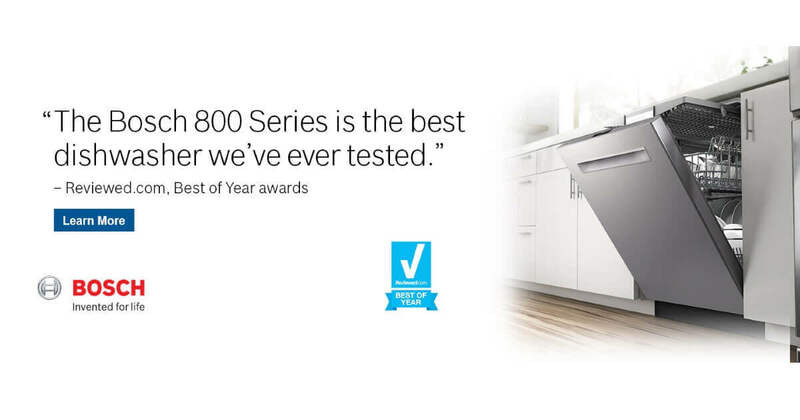 Reviewed.com gives Bosch 800 Series dishwashers a perfect score in their Best of Year awards. Bosch dishwashers also received the Editors’ Choice award for the 300 Series and 500 Series. From the state of the art wash system to the details that make it easier to load, Bosch dishwasher are invented for your life. See for yourself how the details in a Bosch make life easier. 485 quality checks. Quality is in the details. At Bosch, we know that everything our engineers touch, touches lives. Every Bosch dishwasher must pass 485 stringent quality checks before leaving the factory. So you can rest assured that your dishwasher will be ready to take on whatever life throws your way. A range of innovations designed to get dishes their cleanest. Our state-of-the-art sensor wash system uses advanced sensors to give your dishes their most thorough clean, every time. Quiet you can see. Bosch is America's quietest dishwasher brand1 Quiet operation is just as important as sparkling clean dishes. Bosch dishwashers are so quiet, they have InfoLight® to let you know a cycle is running. 1 Based on an average of sound ratings for 24" full-size stainless steel tub dishwashers contained in major brand' websites. Major brands defined as TraQline Top 5 Market Share, December 2017. ENERGY STAR® qualified All Bosch dishwashers are ENERGY STAR® qualified, and our top of the line model is rated at just 239 kWH per year.